A photocopy of your DD-214 displaying your Persian Gulf War Era Service occurring any time between 2 August 1990 through 30 November 1995. 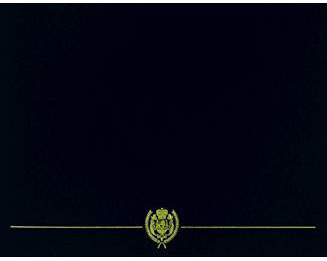 Don't forget to include an unaltered COPY of your DD-214 or other military issued document(s). 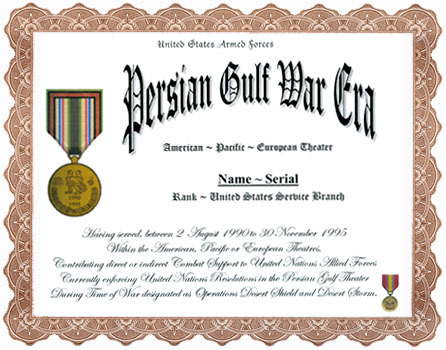 The Persian Gulf War Era Recognition is a commemorative authorized to State Dept, National Security personnel and military veterans of Allied nations for recognition and appreciation of support combatting international aggression during that portion of the Cold War era that involved military operations in the Persian Gulf against the Republic of Iraq between the period of hostilities: 2 August 1990 and 28 February 1991. The proposed medal design for Gulf War Era military service incorporates elements of the United States Persian Gulf War Service Medal, The United States Armed Forces Medal, The United States National Defense Service Medal, and The American Campaign Medal. The East-West facing Eagle represents the dual-service contribution of military service in Persian Gulf, The United States or Europe confronting the global spread of Communism. Both Eagles riding atop and protecting the other's back respresents mutual support for safeguarding of the other's forces. The closed top of the Gulf War Theater ribbon represents the armed containment of Communism on the battlefields of the Persian Gulf Theater of Operations. No medal has yet been cast for this Military Service Appreciation award. The medal's original design is in the public domain.